Hey, guest nice to see you around! If you don't happen to find it here you can always go to our Web Site, NeoCozyCorner. There you can find almost everything, and if not just drop us a line and we will get it for you. In order for you to do any kind of Web Page you need to know the Basics Html Codes. 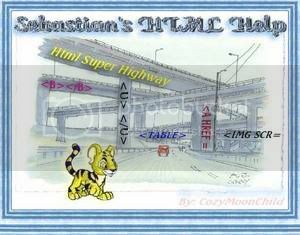 Here You will find a quick and simple explination of what you need to know starting with the definition of HTML, which stands for Hyper Text Mark-up Language. These are the codes that mostly all web pages are written in. These codes are always going to be in triangular brackets. Everything you add to the webpage you make must be in these brackets: . Just remember that you need every tag in order to properly display your content. We wouldn't want any part of Sebastian the Kougra to be missing. Would we? For more Html Help you can refer to our Html Help Page on the web, coming soon. Put your stuff here... You can insert text and images...Also you can change the width of the table and add a background color or a background image. This is the First Column. This is the Second Column. This is the Third Column. Remember you have to make each column width equal to the total width of the table. This is the Second Column. If your table is 300, then each column should be 100 each or 50, 50, & 200. This is the Third Column. You can insert text and images...Also you can change the width of the table and add a background colors. that you can insert in the Tables. To insert an image all you need to do is follow these steps. In the Text Boxes above are some image tags. Copy the Tag and Paste it where you want it to go, and your finished. If you have a different image you would like to use just change the URL to where your image is, then your image should show up..
ALIGN="left The image will be aligned left and the text will be aligned to the right. ALIGN="right The image will be aligned right and text will be aligned to the left. ALIGN="right Two images, One will be aligned to the left the other to the right	with text in the center. HSPACE="40" One image aligned to the left with the text separated by space. The space is determine by the amount you put in. Here is the code for adding an Image as a background. Here is the code for making your background a single color. When your using a Text Box in your pet's page Neopets does not allow you to directly use the word "TEXTAREA". 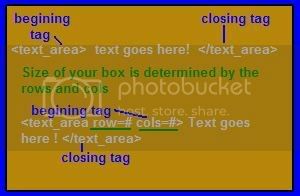 You must place an underscore ( _ ) between (text) and (area) in both the begining tag and the closing tag. The rows determine how long your text box is. The cols determine the width of your text box. Changing the color of Fonts and the Actual Font Family? You can change the glow color to any color you like. Changing the Colors of your Scrollbar. Here is the code to change the colors of your scroll bar. To get different color use the Chart at the bottom of this Page. These tags are called are internal tags. They can be used for Text or Images. An Internal tag will make the text or image clickable to another section of your page. These are also called links. This goes where you want the Index clickable to go too. This goes where you want it to click too.